The Kverneland Exacta CL EW is the ideal weighing spreader for the smaller grower! This ISOBUS compatible weighing spreader is equipped with an unique reference sensor, which will correct automatically on slopes and for shocks. Therefore this spreader can work with high accuracy on rough terrains and in hilly conditions. Speed related spreading, with auto calibration, will help to prevent over and under dosing which will result in better yields and saving of fertiliser. For even more comfort, it is possible to use the spreader in combination with GPS. With GPS controlled spreading the Kverneland Exacta CL EW spreader has 2 sections and automatic start/stop on headlands based on the GEOPOINT. It is even possible to do variable rate spreading according to application maps. The Exacta CL EW can be operated with the IsoMatch Tellus PRO, IsoMatch Tellus GO or any ISOBUS compatible tractor terminal. Highest accuracy in all conditions: even spreading quality guaranteed! Save costs and increase quality: spreading the Easy Way! Kvernelands unique reference sensor technology: all negative influences are automatically corrected and eliminated, ensuring utmost spreading accuracy even on hill sides. 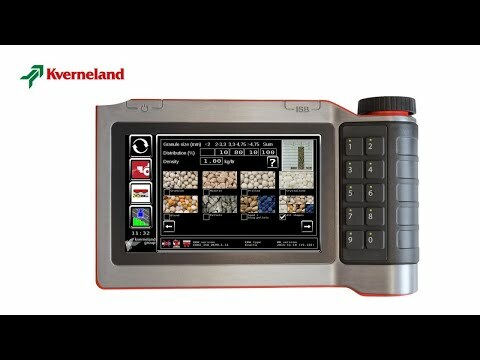 The Kverneland reference sensor gives you absolute accuracy, because every kilo counts! The compact EasySet 'dashboard' gives you considerably simplified accurate setting and adjustment of applicaton rates. Two hydraulically operated metering plates, each with three discharge openings ensure an equal fertiliser flow from the hopper to the spreading discs. The development department of Kvernelands spreader R&D team has its own spreader competence centre in order to allow continuous testing throughout the year. All test are carried out according to the strictest international standards and quality requirements. Kverneland offers the ExactLine system or manual/hydraulic border spreading plate for border spreading. The ExactLine can be accurately set for all types of fertiliser and for all working widths. Operation is easy, no need to leave the tractor seat. For the HL, TL and TLX models the ExactLine can even be fitted on the left and right hand side of the spreader. With the AutosetApp you have always the most up to date settings for your weighing spreader available. The AutosetApp is an App (software application) available on the IsoMatch Tellus or IsoMatch Tellus GO terminal. The AutosetApp is standard integrated into the IsoMatch Tellus GEOCONTROL software. This App connects the terminal directly with the GEOSPREAD weighing spreader and will automatically adjust the spreader according to the settings entered into the App. The AutosetApp will also work in combination with the CL-EW and TL, with the exception being for those spreaders the discharge point (letter setting) still needs to be adjusted manually on the spreader itself. The Kverneland fertiliser spreader database with the most up to date spreading charts is always available online. The AutosetApp can connect to the fertiliser spreading database in two different ways. You can connect it to the online database via the IsoMatch Wireless WIFI USB adapter or download the most actual database from the website www.kvernelandspreadingcharts.com on an USB stick and upload the database directly into the IsoMatch Tellus or IsoMatch Tellus GO terminal.